⛅19C Tuesday 25th July 2017 ~After an aborted attempt to visit RSPB Frampton Marsh last week (car issues) I finally managed to complete my trip today arriving shortly after 8:30 am. First birds of the day were five Snipe, which flew over the car park as I was getting organised. A couple of Green Sandpiper, a good sized Linnet flock, Skylarks overhead, Reed Warblers along the reedbeds and a half dozen Ruff in various plumages before I settled into the hide. One of three Spotted Redshank today.. Some spectacular flocks of Black-tailed Godwit and Dunlin, once again in various plumages and just within camera range a moulting Spotted Redshank. 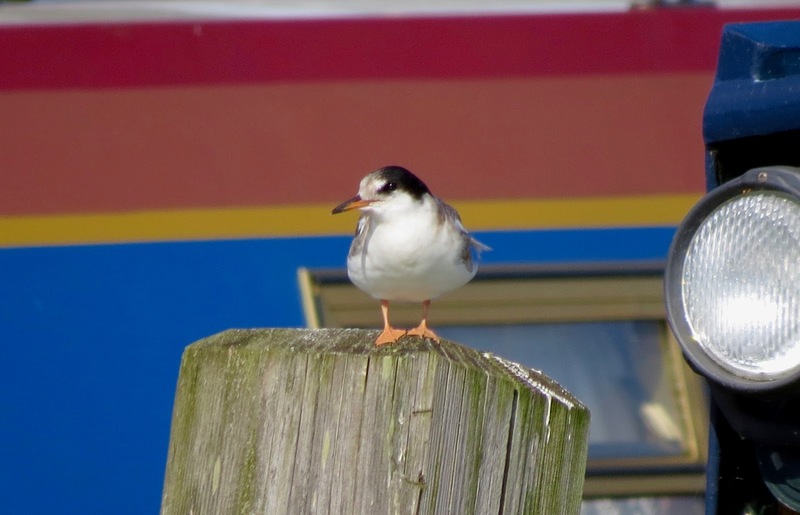 At least 30+ Common Terns, which included a good percentage of young birds, two Curlew Sandpipers, Little Stint and a selection of other waders: Ringed Plover, Little-ringed Plover, Avocet, Common Sandpiper, Redshank and Lapwing. Whooper Swan ~ Not a bird you see every day during the summer months. Over towards the east bank a group of three Spoonbill, fast asleep and indeed remaining so during the rest of my visit. The long staying Whooper Swan was also active, mostly preening. From the hide, an anti clockwise walk to the sea wall, stopping occasionally to check out the scrapes. A couple of Hare, more Ruff and a single Wood Sandpiper, which was unfortunately flushed due to some ongoing brush cutting. Across the wet grassland to the west the only Marsh Harrier of the day and a group of five Greenshank in the channels! A large gathering of birders is always a good sign, this one along the sea wall and all enjoying good views of a Pectoral Sandpiper! I enjoyed some decent scoped views myself but only managed some appalling record shots! While enjoying the cat and mouse antics of the Sandpiper, which constantly moved in and out of the long grass a Yellow Wagtail became the latest addition to the daylist and a Whimbrel another, dropping in among a group of Godwits. After a good look at the Pectoral and a chat with a few other birders, I continued on and had lunch in the East Hide. While here a small movement of Swifts with Swallow, House Martin and Sand Martin also noted. After lunch a pleasant stroll around the reedbed trail, which produced the usual Yellowhammers, along with Whitethroat, three Corn Buntings and a Grasshopper Warbler, which despite singing well remained elusive. ☔ Sunday 16th July 2017 ~ Visits to Brandon Marsh last Friday and today and frankly with the amount of disruption both on the pools and in the reedbeds, which seems to occur daily these days, I'm always surprised to find anything of interest during my visits to the hides! This is one reason why I've adopted the idea of bypassing them in favour of exploring the woods and meadows that Brandon's diversity provides. Friday, despite cloudy skies I managed a nice selection of butterflies and moths, particularly around River Meadow, where a single Purple Hairstreak was along the treeline. The meadow itself provided the usual array of Meadow Brown and Ringlet butterflies. Five Small Copper but no sign on this occasion of any Marbled White, doing so well this year. Gatekeepers are in abundance now and another butterfly seemingly doing well, Red Admiral, with 15 sightings throughout the reserve! I'm spending more time seeking out moths, for me a real learning curve and came across Common Carpet and Shaded Broad-bar, feel free to correct my ID at any time! Both Six-spot Burnet and Narrow-bordered Five-spot Burnet could be found along the 'Tip', plus several Cinnabar. Dragonfly's included: Brown Hawker, Black-tailed Skimmer and both Ruddy and Common Darter. Today, no surprise to find East Marsh pool disrupted once more, ringing birds seem to take priority, to the detriment of any visitor but to be honest, my visit was mainly to catch up with the Sunday regulars! After a brief spell in East Marsh hide a walk over to the 'Tip' area and River Meadow. Broadleaf Helleborine ~ Lovely shade loving Orchid! Purple Hairstreak once more along the River Meadow treeline and an opportunity to photograph a Green Lacewing near the Farm reedbed ended another frustrating visit! ⛅ Sunday 9th July 2017 ~ A nice cruise back to our home mooring on Sunday evening after an enjoyable stay out on the canal. Grass Snake ~ Amazing swimmers! On the cruise home Dee managed a nice photo of a Grass Snake swimming alongside the boat. ⛅ Monday 10th July 2017 ~ I decided on a visit to Brandon Marsh today, arriving a little after 10:30am. As per usual these days I spend little time in the hides, preferring to tour the woods and meadows, which are less disrupted!! Despite the overcast conditions there was still plenty on offer and after passing through Horsetail Glade, where I encountered a family of Great Spotted Woodpeckers, I took time out at the bench. Scanning the surrounding vegetation I was a little surprised to find a White-letter Hairstreak, not in the best condition I might add but a species I've not encountered in this area before. White-letter Hairstreak opposite the Horsetail Bench! From here a walk to the Ted Jury hide with stops at East Marsh and Teal Pool hides along the way. As predicted nothing too much of note, four Common Terns and two recently fledged Little-ringed Plover the best on offer! On route across to the 'Tip' area a juvenile Grey Wagtail along Goose Tail posed kindly for a few photos. 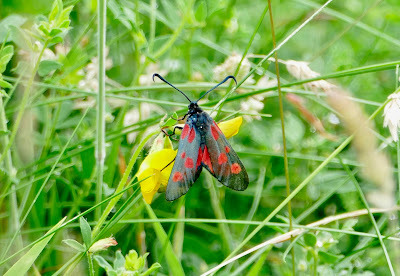 The 'Tip' had plenty to offer with at least four Six-spot Burnet moths, a trio of Mint Moths and my first Brandon Gatekeepers, baring in mind I haven't visited for a few weeks! I bypassed River Meadow on this occasion (too breezy), instead continuing on around the farm area and top reedbeds. 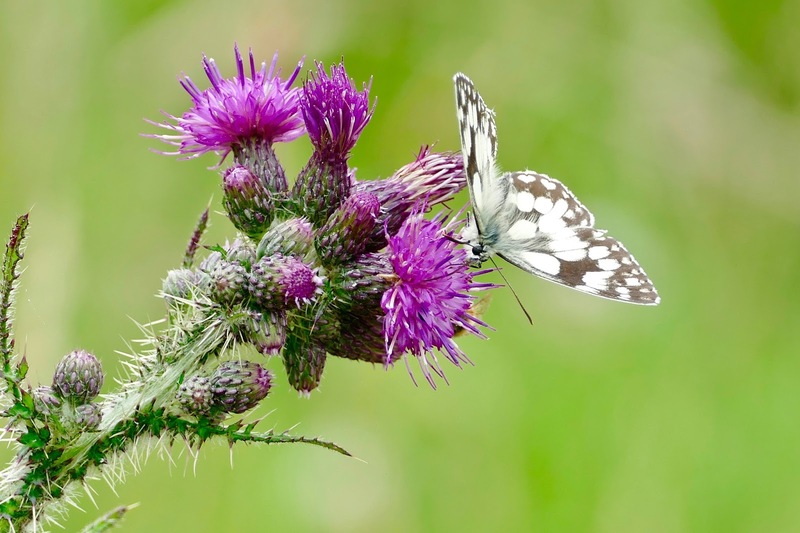 Still plenty of Marbled White butterflies, enjoying a bumper year it would seem but yet again not a single Common Blue, sadly the other end of the spectrum!! ☀️ Thursday 6th July 2017 ~ Each year around this time a family of Common Terns appear at the marina and usually hang around for a week or two. I can only image that the fishing is pretty good, with plenty around the marina compounds and at Napton Reservoir, just a brief flight across the canal. In recent years I've managed to establish that these birds, amazingly had been ringed at Brandon Marsh. 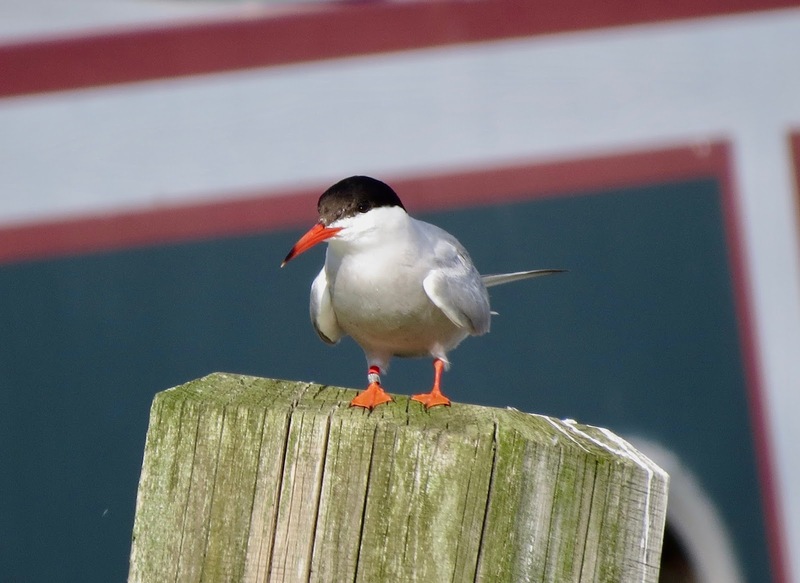 It was no surprise therefore that after mentioning the ring configuration on one of the birds to Jim Rushforth (Brandon Ringer) it appears that once again we have a Brandon visitor. Sadly one of the rings, which should appear on the left leg and would depict the year of birth had unfortunately been shed. As for the youngster, well this bird has no ring and so knowing Jim's enthusiasm for such things I can only conclude that the adults, for this year at least have nested elsewhere! With things beginning to return to some normality after Mums funeral Dee and I decided to take our first cruise of the year, out to our favourite spot at Flecknoe! Talking of Mum, thank you so much to everyone who took time to text, whatsapp, tweet and even send cards to the marina, it's very much appreciated. The cruise took around 90 minutes and with the temperature in the high 20's there was plenty of insects on the wing. These included no end of Banded Demoiselle and the odd Horse-fly!! A nice selection of butterflies included Meadow Brown, Small, Large and Green-veined White. As I was coming under the road bridge at the A425 a Red Kite drifted north and I suspect the same bird was seen later in the day over our mooring. Yellowhammer ~ A constant companion at the current mooring! The usual farmland birds were encountered and included Linnet, Skylark, Yellowhammer, Red-legged Partridge and more Greenfinch than I recall. 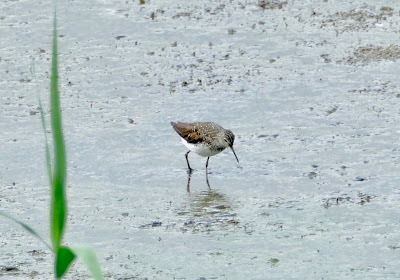 ⛅ Friday 30th June 2017 ~ I began at the East Marsh and Teal Pool Hides, where there is now water after the recent rain and ended up with a reasonable wader count. These included (3) Redshank and (3) Green Sandpipers on Teal Pool and an eventual count on East Marsh Pool of single Little Egret, Ringed Plover, (5) Little-ringed Plover and no less than (7) Oystercatcher, when a few invaders flew in causing mayhem among the resident birds! There was plenty of Kingfisher activity, with birds back and forth during my stay in the hides and of course plenty of young passerines too, with (7) Teal on the pool also notable. While in the Teal Pool hide Swift numbers were well into the 30's. Ted Jury Hide had the resident Kestrel family perched around the adopted Barn Owl box, (2) Buzzard and at least one active Hobby. A warmer day than of late meant that despite the lack of sunshine there were plenty of odonata, bugs and butterflies on the wing and so the rest of my visit was spent investigating. I enjoyed my packed lunch on the Horsetail Glade bench and while here Green-veined White, Red Admiral, Comma and a single Small Tortoiseshell, the later not too common at the moment. Talking of uncommon butterflies another complete blank on Common Blue and Peacock throughout the reserve during my stay! White-letter Hairstreak ~ Usual spot along the meadow treeline! The 'Old Tip' area and River Meadow next, the tip producing at least 3 Narrow-bordered Five-spot Burnet and several Cinnabar moths. 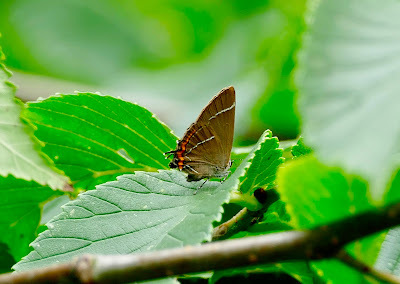 River Meadow was bristling with Meadow Brown and Ringlet butterflies and in the usual tree (4 consecutive years now) my annual look at White-letter Hairstreak! A Lesser Whitethroat was singing most of the time along the river line while here! A closer look at River Meadow produced (6) Small Skipper, (2) Large Skipper and a single Essex Skipper and a butterfly that is doing extremely well on the reserve is the Marbled White, with twelve recorded on the meadow and several more around other areas! Dragonfly's noted: Emperor, Black-tailed Skimmer and Brown Hawker. Finally a walk around the Farm Meadow and top reedbeds produced a young Fox cub, presumed more around, a single Small Heath butterfly and flyby Hobby!